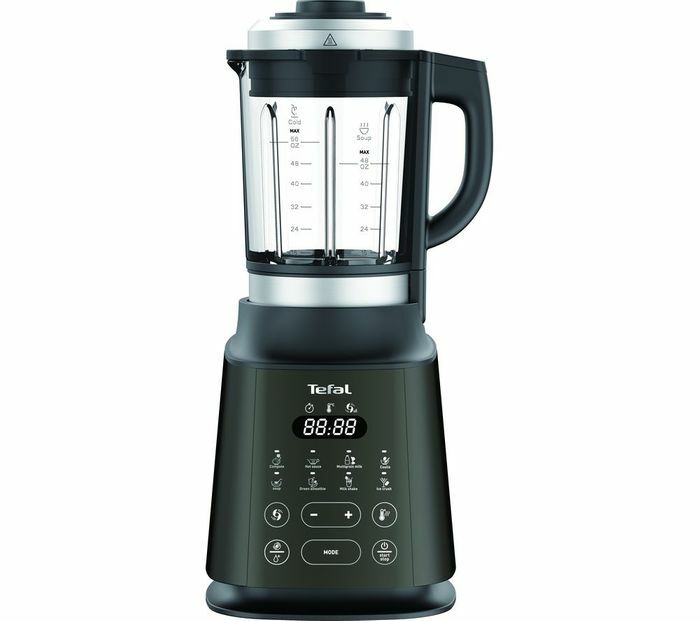 The Tefal Ultrablend Cook+ BL965B40 Blender is powered by a 1300 W motor, allowing the stainless steel blades to slice through the ingredients. This creates ultra-smooth liquid in seconds, delivering creations full of nutrients and flavour. With its in-jug heating element, the Ultrablend Cook+ offers the option to cook or boil your fruits and vegetables, reaching temperatures up to 100°C. A sensor monitors and adjusts the temperature for precise results every time. The thermo-resistant jug is ideal for both hot and cold preparations. For added peace of mind, the secure lid must be locked in order to start blending, preventing unwelcome, messy mistakes. There's also a built-in steam cap, which can be used to let off steam while heating or adding ingredients. Touch controls make it easy to use the blender, with eight automatic programs and an auto-clean function making it easier to create delicious masterpieces.